VetzLife is the true professional veterinarian strength. TWICE the strength of PetzLife, their consumer strength product. 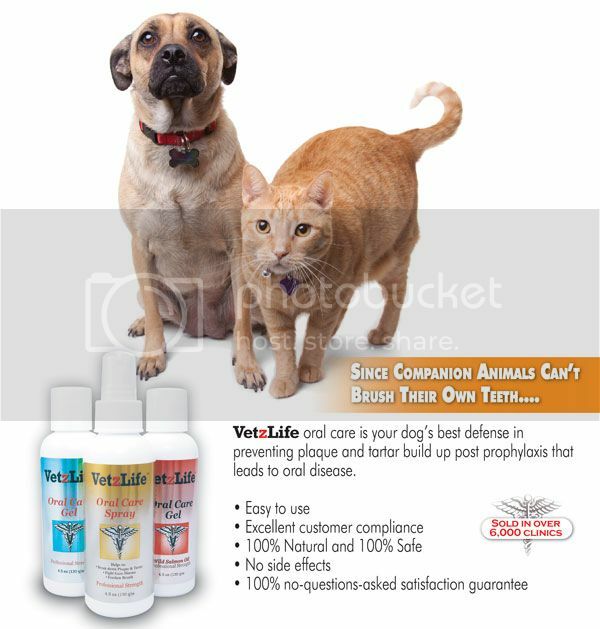 Vetzlife Oral Care Gel is 100% natural. It has been tested by an independent lab and found to be perfectly safe for your pet(s). There are no side effects and is safe enough to use on people! Apply twice a day onto pet's teeth and gums. Keep food and water away for at least 30 minutes after applying. Apply gel directly to the largest area of tartar (see easy use tips). You will notice your pet licking its lips repeatedly. This helps mix the Oral Care with your pet’s saliva and the natural ingredients will coat all surfaces of your pet's teeth and gums. *1st 2 weeks use twice/daily if there is a heavy tartar build-up and/or red inflamed gums are present. Otherwise, one application per day is normally all that is needed for moderate buildups. *For best results, withhold food and water 30 minutes before and after applications. Nighttime is best so that VetzLife Oral Care can work all night. *Brushing is not necessary but it will help accelerate the desired results. The brushing action helps remove plaque and tartar that already has been softened. Use soft or finger brush - Or use a piece of gauze or tissue and wipe the teeth after 8 to 10 days -You will be amazed at how much of the plaque and tartar will come off! *After 1 to 2 weeks, inflammation should subside and breath should be greatly improved. Generally, after 30 days, you can reduce applications to 2 or 3 times weekly for maintenance. especially for small lap dogs; or, place a smear of peanut butter on their dish and squeeze the “Oral Care Gel” on top. *For cats put some gel directly on top of paws or on top of hind legs and they will lick it off. The main ingredient is grapefruit seed extract.